LiveCode LessonsLiveCode LessonsHow To - LiveCode Mobile Tasks In-App PurchasingHow do I implement in-app purchases in LiveCode - Amazon Appstore? In order to use the in-app purchase with LiveCode, we must first create it in the Amazon Appstore Developer Portal. From the front page of Amazon Appstore Developer Portal, go to Dashboard, select the app for which you wish to create an in-app purchase, click "In-App Items”, and click “Add a consumable”/ "Add an Entitlement"/ "Add a Subscription", depending on the type of the product you want to add. From there, follow the instructions to create the type of in-app purchase you wish to use. In the stack for this lesson, we are using a consumable, a non-consumable (or an entitlement, according to Amazon's terminology\P \P \ and a subscription purchase. 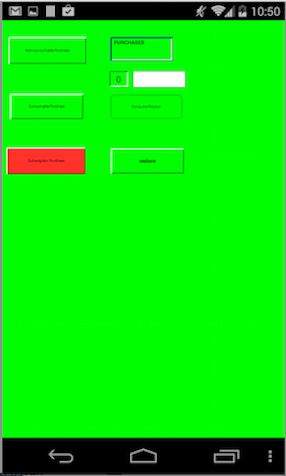 First create three buttons. One button for consumable, one button for non-consumable and one button for subscription. Then add code that allows us to interface with the Amazon Appstore and request the in-app purchases for download. mobileStoreMakePurchase "com.runrev.sampleapp.sub.month", "1", "This belongs to me"
The mobileStoreSetProductType command is used to set the type of the in-app purchase. The type can either be “inapp”, for consumable and non-consumable items, or “subs” for subscription items. This distinction is not always necessary, since it is only used by the underlying Google API for in-app purchases, because it uses different methods, depending on the item type. However, it is recommended that you always use this command, even for non-Google stores. The mobileStoreSetProductType command is used with the identifier and the type of the in-app purchase we are requesting. These values must match the identifier and the type of an in-app purchase that has been set up in the Amazon Appstore Developer Portal for the app. The mobileStoreMakePurchase command is then used with three parameters, denoting the in-app purchase identifier we are requesting, the requested quantity of the item and the developer payload. The quantity should always be “1” for non-iOS apps. The developer payload is a string that contains some extra information about the order. This command sends the request and begins the purchasing process. The purchaseStateUpdate message is then generated as the purchasing process takes place. This is sent with three parameters denoting the product identifier, the purchase identifier and the state of the specific purchase that the message is regarding. In the handler, the state of the purchase is checked using the parameter pState. Here we take action if it returns paymentReceived, indicating that payment for the purchase was received, or restored, indicating that the restoration request was successful. In all other cases, we print a message to the screen giving details on what is happening. In case of an error, mobileStorePurchaseError can be used with the purchase ID to find the details of the error, and then use the mobileStoreDisablePurchaseUpdates command to indicate that the purchase process is complete. This is not essential in all circumstances, but is good practice. mobileStoreDisablePurchaseUpdates is used in cases where the item is already owned by the user, or there is no item with the specified identifier in the store listing, or the user cancels the purchase. In case of payment being received, or the purchase being restored, the app can take action to finalize the purchase or the restoration process. This app permits multiple in-app purchases and we use the pProductID parameter with offerPurchasedProducts to find identify which in-app purchase is being being processed. We can then take appropriate action for the in-app purchase that is being purchased or restored, and use the mobileStoreConfirmPurchase command to confirm to Amazon that payment has been received, finalizing the in-app purchase process on the Amazon Appstore’s side. The bundle identifier that you create the standalone application with, as specified in the standalone application settings, must match the bundle identifier tied to the in-app purchases in Amazon Appstore Developer Portal. The above step handles a purchase. In this app, we set a custom property to indicate to the app that the purchase has been made. With the non-consumable and the subscription purchase we set a custom property to true, but with the consumable in-app purchase, the user can purchase it as many times as they like. We increment a custom property to indicate how many times a purchase has been made. We can now use these custom properties to take action based on the in-app purchases the user makes. 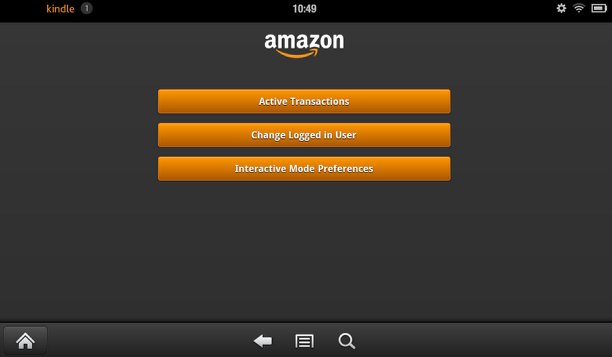 Handling the in-app purchase process records the purchases with Amazon and transfers money. For this app, we are using the non-consumable purchase to change the background color of the stack and change the text of a field. The consumable purchase is used to make a graphic flash on and off briefly. The subscription purchase is used to change the color of a button. set the backgroundColor of button "sub" to "0,0,255"
For the consumable purchase, we want the user to be able to activate it whenever they want rather than immediately. For this we use two handlers, a setProp and a button. The setProp indicates to the user how many consumable purchases they have remaining, and the button is used to consume and activate the consumable. This 'uses up' a consumable each time the user clicks the button, and only lets them carry out the action we want if they have purchased a consumable in the first place. The mobileStoreConsumePurchase command is called with the consumable product identifier. This command removes the consumable item from the user's inventory, so that it will not be contained in the list returned by mobileStorePurchasedProducts function. 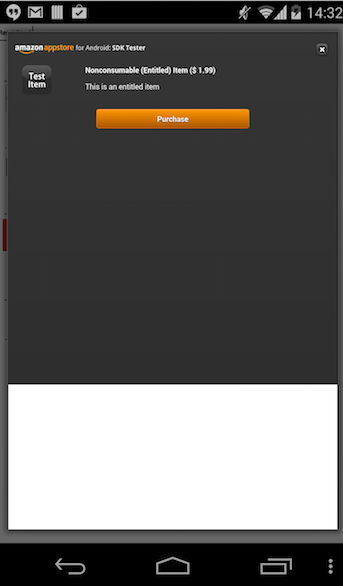 Our custom properties revert to whatever values they are at build-time, each time the app is closed. One could therefore assume that custom properties have to be saved explicitly, allowing us to re-load them every time the app is opened. This is not the case for non-consumable and subscription products. The app is no longer responsible to retaining what the user has bought. All the purchased items of this type (non-consumables and subscriptions\Pcan be restored, not only in the particular device where the app was installed, but in every device the user owns. This can be done using a “restore” button. Here, mobileStoreRestorePurchases command queries the user’s inventory of purchased items, and returns them in the purchaseStateUpdate pPurchaseID, pProductID, pState message. The purchaseStateUpdate message is called as many times as the number of items the user owns, each time with a different pPurchaseID and pProductID, but always with the same pState : restored”. In that case, the flow should be exactly the same as when the user successfully purchases the product for the very first time, with the difference that this time no actual payment occurs! 2. They click on the non-consumable button, and send a purchase request to the Amazon Appstore for the non-consumable item. 3. The Amazon Appstore responds and asks for the user’s password. The user types their password. 4. The Amazon Appstore responds that the purchase is successful. 5. purchaseStateUpdate message is called with parameters (“1”, ”nonconsumable_product_name”, “paymentReceived”). Now, if the user exits and re-launches the app, the background is not green. But if they select to purchase the non-consumable itemagain, they get an “Already Owned” message. The purchaseStateUpdate message is called with parameters (“1”, ”nonconsumable_product_name”, “alreadyEntitled”). If they want to get the purchased item, turning the background green, all they need to do is click on the “restore” button, which calls mobileStoreRestorePurchases. Q: Why do I get a different SKU back when I initiate a purchase for my subscription SKU? A: A subscription is comprised of a non-buyable parent SKU and one or more child term SKUs. This setup prevents users from purchasing multiple subscriptions of the same product. The non-buyable parent represents the product being purchased and is the SKU returned in the purchase response. The child SKUs represent the different subscription terms and are used to initiate the purchase. Subscription terms and charges are handled by Amazon and your app only needs to check whether a subscription is valid. This means that in the purchaseStateUpdate message we have to handle both SKUs (parent and child SKU\P: The child SKU is returned with purchaseStateUpdate message when making a subscription purchase for the very first time, and the parent SKU is returned when we restore previous purchases. 1. The Amazon SDK Tester. This is a developer tool that allows users of the Amazon Mobile App SDK (ie the Amazon API that is used for in-app purchases\P to test their implementation in a production-like environment before submitting it to Amazon for publication. This will allow developers to construct test cases that cover all responses generated by the Amazon Mobile App SDK APIs, and give them confidence their apps will be published and run correctly. You must install it in the Android device that will be used for testing. 2. A .json text file that will contain the IAP item information used to respond to IAP API calls. This file should be written to the "mnt/sdcard" directory on the device that will be hosting the SDK Tester. Prev: How do I implement in-app purchases in LiveCode - Apple AppStore? 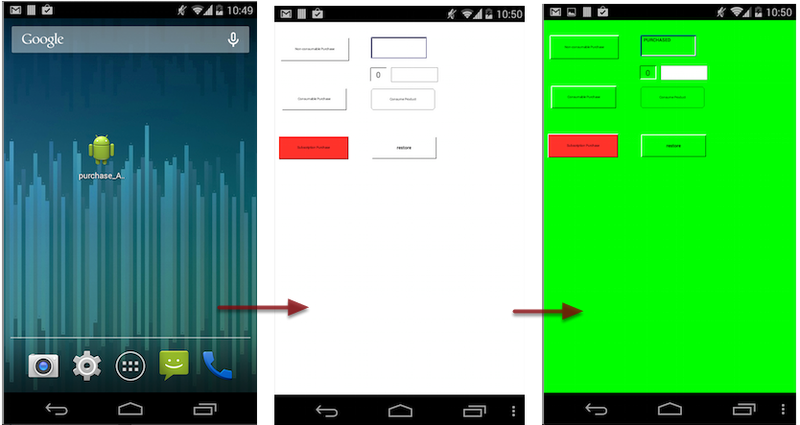 Next: How do I implement in-app purchases in LiveCode - Google Play Store?